Vivo has unveiled its Apex 2019 concept phone after teasing it for a while, and it comes with no ports, no physical buttons, and well, no selfie camera. The Vivo Apex 2019 is likely to be on display at MWC 2019, and while this phone is just a concept, something similar or inspired by may be launched later in the year, similar to what the company did with Vivo Apex. The Vivo Apex 2019 sports an all-display design without a notch or a punch-hole and packs a dual camera setup at the back, and connecting pins at the rear end for charging and transferring of data. Today’s Vivo Apex 2019 introduction follows the Meizu Zero announcement, which too has no physical buttons or ports. There is no word on the availability of Meizu Zero as well. As is the case with a concept phone, there is no release date, and there may never be. The pricing, obviously also doesn’t come to play here, and the company has only listed a few specifications for the user to get a general sense of what Vivo wants to achieve with this handset. The biggest focus is the radical design the Vivo Apex 2019 sports, and it looks to set the trend for the year ahead. The Vivo Apex 2019 doesn’t have any physical buttons whatsoever, and relies on pressure and gestures for quick actions – similar to the Meizu Zero that was unveiled yesterday. Vivo is calling this technology Touch Sense and it’s a mix of capacitive touch and pressure sensing. There’s also an in-screen fingerprint sensor, which the company claims covers almost the entire display. ‘A larger sensor also enables more features to bolster security for using apps. When users wake their device from an inactive screen and press on the corresponding app icon to scan their finger, they can unlock and gain direct access to the app so that the experience is faster and more efficient than before,’ the company explains. As mentioned, there are also no ports or the headphone jack in sight, but it does sport magnetic pins at the back called MagPort that will support charging and data transfer. It comes with slim bezels on all sides of the display with a slight chin at the bottom, and features a ‘Super Unibody’ curved glass design. It also turns its display into a speaker by using Body SoundCasting technology, transforming the entire Apex 2019 display into a speaker via the screen vibration function, avoiding the need for a speaker grill. At the back, we can also see the dual camera setup stacked vertically, specifications of which have not been specified. As mentioned, there’s no indication of the selfie camera as well and it can’t be seen in the photos as well. Whether there is a pop-up selfie camera hidden there is still a mystery, something that will only be revealed at MWC next month. The company did tease an upgraded elevating selfie camera recently. The Vivo Apex 2019 comes with 5G support, and integrates Qualcomm’s Snapdragon X50 5G modem, the Snapdragon 855 SoC, 256GB of storage, and 12GB RAM. It brings support for Jovi AI Assistant and many other smart functions as well. To make room for the new 5G module, the Vivo Apex 2019 uses a new Duplex PCB Design, which has increased the available space by 20 percent to minimise the overall stacking space. “With the goal of enhanced usability and simplicity at the core, Apex 2019 offers consumers a glimpse into the future of smartphone design and development. 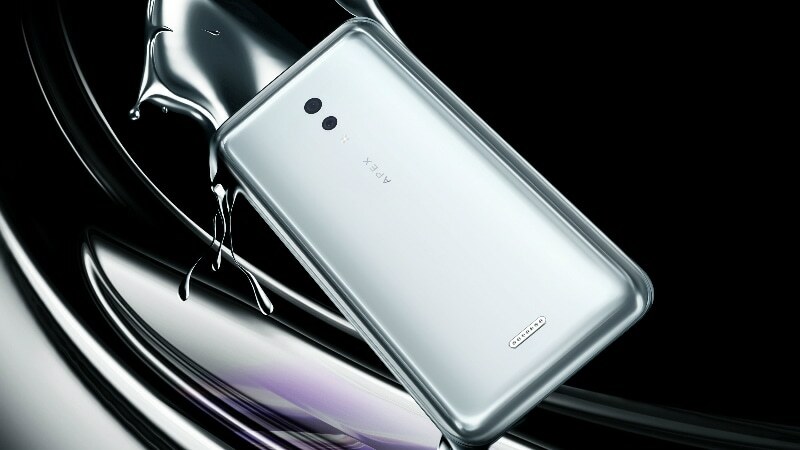 The Super Unibody design and Full-Display Fingerprint Scanning technology, among several other breakthrough features, make Apex 2019 a truly exceptional smartphone that demonstrates Vivo’s continuous exploration and pursuit of exceptional innovation for consumers,” said Spark Ni, Senior Vice President of Vivo, in a statement.